April was a very busy month with very little getting done. Everyone in the house was sick and to the doctor's office at least once. A lot of things didn't get done, including my pledge to post the progress of my garden. But inspite of me, my garden has prospered. Please check out the pictures while I go stand in the corner as punishment. LOL. 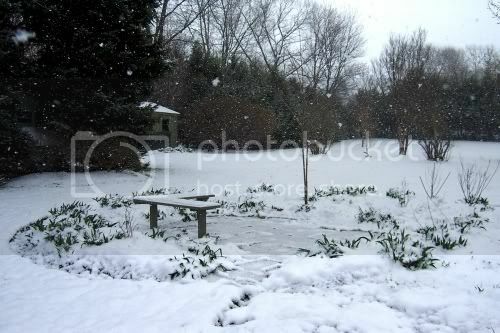 This is obviously the garden during our early April snowfest. We were to have mulch delivered and spread that day. Gee. I wonder why we didn't. Here is on the 16th after we got the mulch down. It was raining that day. 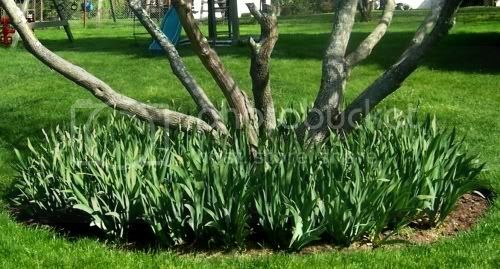 The yellow daffodils are just about done. Here we are on the 26th. The white daffodils are now out. 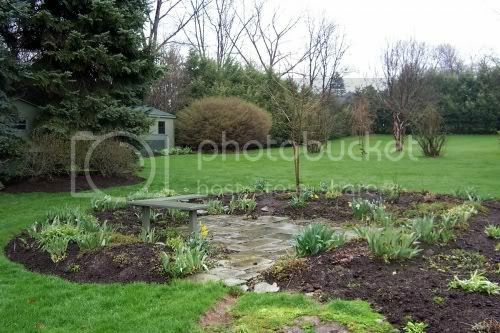 The small green blob to the left of the daffodils to the left of the tree are my peonies. And here we are today. The peonies are about 2 feet tall. Check out the tree leaves! There's not much bare space, as a lot of other plants, including weeds are coming out. 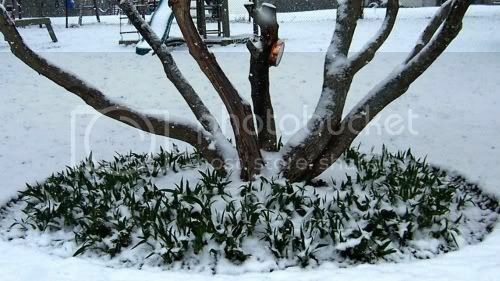 Here's the iris bed in snow. Bleh. And here's the iris bed today. I don't know if you can see the flowers -- not sure what the head is called in this stage. My BIL who lives a few miles away said his irises aren't out as much as mine. I'll attribute it to the mulch. Okay, can I come out of the corner now? Now that I spent an hour relearning how to resize and upload photos, I'm hoping I won't take so long to post again. I was at the garden center today to buy zucchini seeds and saw peony baskets. I'd never seen them before. Has anyone ever used them? Similar to a tomato basket but wider. Makes sense. I usually use fishing line to hold mine up. I love peonies, but I can't stand the ants that love them too. I'll be starting my zukes inside. Not sure what else I'll plant. My DS brought home two pea plants that he started from seed in science class, so those will find a special place in my garden. This child hates peas, but he's looking forward to eating these peas. LOL. Kids are so funny! Yes, Amy you can come out of the corner now, you did a good job with the pictures. Everything is coming along nicely, so lush and green. I even liked the looks of it in the snow, but then that is just me. AmyL, really love the way you positioned the camera in the same location with each photo, allows one to see change with much more impact. And change there is, lots of it. Looking great. Glad you are feeling better Amy. 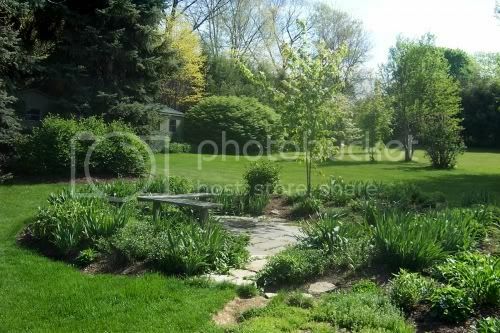 Your garden is really lovely, such a difference in the photos. You are unpunished because you did such a good job.Please take close up shots of the peonies when in bloom. Thanks for all the comments and well wishes. It was my intention to take the pics from the same position. 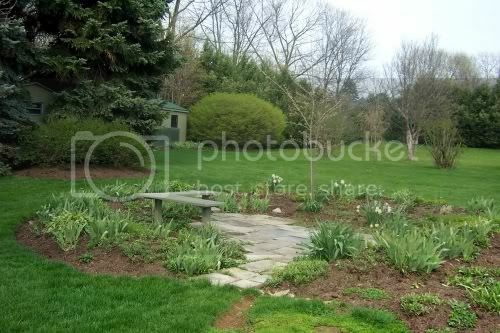 I love time-lapse photography, but obviously, I couldn't leave my camera out, so I lean against the patio wall and line up the bench and maple tree with the little square in the view finder. DH wants to take down the tree this summer. My inital thought was, "Gaaaa! How will I line up my pictures!?!". My second thought was, "cool, less leaves to rake in the fall." LOL. I'll post peony pictures when they pop. Shouldn't be long.